With a spacious living room and kitchen, this 11th floor condo has everything needed to keep up to eight guests comfortable satisfied. The unit has two bedrooms two bathrooms with a king size bed, two queens and a sleeper sofa as well. The unit includes an ironing board as well as an iron and hair dryer in case you forget to bring your own. The full kitchen includes a built-in microwave as well as, a dishwasher, refrigerator, stove, coffee maker and comes with all the necessary utensils needed to prepare great seaside dinner. The resort has its own restaurant, the Ocean View Café as well. An in-unit washer and dryer that spares the guests the hassle of carrying laundry back forth. Other features include; free internet access and a private balcony overlooking the ocean. It features an indoor and outdoor pool, along with a hot tub, children’s pool and to top it off a lazy river for the whole family to enjoy! It also includes an exercise room with state-of-the-art cardio and strength training equipment is also available. In addition to the onsite restaurant, there is a variety of good restaurants nearby with the Compass Rose and The Crow’s Nest Oceanfront Bar & Grill just steps away. 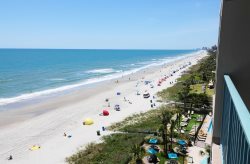 Myrtle Beach Sate Park is under three miles away and the Market Common urban village with shopping, dinning and entertainment is less then two miles away. Fun things to do in the vicinity include multiple miniature golf courses, a TV and Segway tours. So, come enjoy your stay at the Holiday Suites!